Secondhand smoke is a combination of the smoke emitted from a burning cigarette, cigar, or pipe, and the smoke exhaled by the smoker. Also known as environmental tobacco smoke (ETS), it can be easily recognized by it's distinctive odor. Secondhand smoke contaminates the air and is retained in clothing, carpets, curtains and furniture. To many individuals, secondhand smoke is unpleasant, causing symptomatic irritation of the eyes, nose, throat, and lungs. More importantly it also represents a significant health hazard. Of the more than 4,000 different chemicals found in secondhand smoke, over 40 have been shown to cause cancer. Although secondhand smoke is a danger to everyone, children are particularly vulnerable. Exposure to secondhand smoke decreases lung efficiency and impairs lung function in children of all ages. It also increases both the frequency and severity of childhood asthma. It can aggravate sinusitis, rhinitis, cystic fibrosis, and chronic respiratory problems such as cough and post-nasal drip. Children exposed to secondhand smoke will also suffer from more colds and sore throats. Those children whose parents smoke half a pack a day or more are at nearly double the risk of hospitalization for a respiratory illness. Of course, people of all ages are at risk of the effects of exposure to second hand smoke. Long-term exposure is well documented to be one of leading causes of lung and throat cancer as well as emphysema. 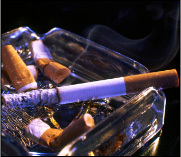 Tobacco smoke can also damage personal property and valuables. It contains tar which adheres to walls, furniture, carpets, clothing and other articles. This can damage your valuable possessions and at the same time leaves an unsightly film of liquid tar. Secondhand smoke is one of the more challenging contaminants to remove from household air due in large part to the high rate of re-contamination and the wide array of chemicals contained in cigarette, cigars and pipe smoke. When possible, it is best not to smoke indoors. To handle the high rate of re-contamination cause by smoking indoors, an air cleaner that is capable of providing a higher number of air exchanges per hour (can process more cubic feet of air per minute) is vital. Accordingly, it is also important to have a reasonable expectation regarding square footage that a unit can adequately cover in a particular area or room. A combination of air treatment technologies is also generally recommended as secondhand smoke contains not only particulate-based contaminants, but also a wide range of gases and chemicals that cannot be removed by a HEPA filter. Secondary filtration using activated carbon is highly recommended. Certain air cleaners also feature specialized tar filters and/or special carbon blends to improve effectiveness. We highly recommended the Airpura T600 air purifier which was specifically designed for tobacco smoke contamination. It combines a medical grade HEPA filter, a tar filter, and a large activated carbon filter for maximum removal of the gaseous chemical contaminants. In addition to removing smoke particles, the Airpura T600 removes tar, harmful chemicals, and odors associated with tobacco smoke. It also features a very powerful fan that treats more air per minute than any other air cleaner presently available on the market, yet it operates relatively quitely in comparison to its strength. Other options for the removal of tobacco smoke include a quality air cleaner combining HEPA and activated carbon filtration, including the Austin Air Healthmate and Healthmate+ Series, and various Airpura air purifier models designed for VOC or chemical reduction.